Astonishing pricing make these easy to recommend. The Funcl AI true wireless headphones sound far better than their pricing should allow for, making them incredibly easy to recommend. Great-sounding true wireless headphones are in many respects the Holy Grail of portable audio. Free from cables and comfortable enough to forget they're even in your ears, they're currently usually let down by three factors – a high price point, inferior sound quality and troublesome connectivity. The relatively-unknown audio brand Funcl, with its new Funcl AI earbuds, is making an interesting gamble then – entering from a crowdfunded standpoint that allowed early bird buyers to pick up its earbuds at a fraction of the price of its competition, and eventually hitting retail at still-affordable price point. They're not perfect, but with a price tag that's close to pocket money, you'll be hard pressed to find a better deal than the Funcl AI headphones all year. The Funcl AI true wireless headphones are now available from sellers like Amazon for $79, which converts to roughly AU$110, or £60. The Funcl AI headphones caught our attention as a crowdfunded project, where they were selling with an astonishing early-bird discount from their IndieGoGo campaign page which took the price down to $49 for a lucky few early purchasers. The Funcl AI, given the context of their price, punch well above their weight and perform superbly, easily worth considering alongside the best cheap headphones we've tested in the past. In terms of the competition, they most closely resemble the Apple AirPods, which cost $159 / £159 / AU$229. While Apple’s buds offer a seamless connectivity setting for their iPhones, they’re not much use with Android phones. The Funcl AI will work well with both. We currently consider the Jabra Elite 65t our best true wireless earbuds, but they’re more than double the price of the Funcl AI, which we’d say give them a run for their money too. So what else makes them so great? Read on. If you’ve seen the Apple AirPods, you’ll know what to expect from the Funcl AI true wireless earbuds. Wireless earbuds that sit on short stems that hang just out and down from your ear, they’re stored in a pillbox-like case that also charges the buds, and acts as an on-the-go battery top-up unit. It’s a neat design – the lid shuts with a satisfying snap, and the buds slip into place with a magnetic hold, ensuring they’re effectively charging rather than rattling around in the case enclosure. You’ll get 6 hours of playback from the fully charged earbuds, while the case itself holds 18 hours of battery, giving you an effective 24 hour battery life. Small blinking red and white LEDs on the case and the buds indicate connectivity and charging statuses, while the case itself can be recharged over microUSB. In addition, there’s also an app for tracking battery status – it’ll eventually let you customise AI assistant controls too, but that’s a feature not currently active in the version of the app available now. The pillbox itself is small and light, with curved edges. It’s about 2-inches in length, and an inch tall. You’ll hardly notice it in a bag or jacket pocket. The Funcl AI earbuds themselves are incredibly light and comfortable. You get a good range of eartips in various sizes in the box, making finding a good fit a breeze. Like the case, you’ll hardly notice them when in use, and so can be used for hours without discomfort. Though they appear larger in the ear than the Apple AirPods, they’re equally as ergonomic when in your ear. However, the silver trim and large “f” logo make them a bit less refined in terms of aesthetics. Each earbud has a touch sensitive area that lets you control music playback and calls, and access your phone’s voice assistant. As ever with headphones lacking in an in-line remote, it can get a bit fiddly – you’ll have to remember what the left and right buds do, and how many taps or long-presses activate which function. It can feel a bit funny pushing the buds into your ears as a you control them too (though to be fair, hardly any pressure is required). But at least you won’t have to get your phone out to do anything except managing volume levels. The Funcl AI makes use of Bluetooth 5.0 to connect to your devices. For the most part, this was incredible stable – pair them once, and then every time you take them out of their case, they’ll connect to your device of choice automatically. However, that first pairing wasn’t entirely without hiccups – in a tech filled office with multiple people using Bluetooth products, our phone struggled to find the Funcl AI. Once we got out of that (to be fair, unusual) tech filled bubble, they paired and remained so. There’s just the whiff then that their signal strength is being hindered in some small way. Finally, the Funcl AI support IPX5 water resistance. That’s not good enough to take them for a swim, or into the shower, but you won’t need to be concerned about their condition after a sweaty workout. We were very impressed with the Funcl AI headphones audio performance – at least against the Apple AirPods, the competitor they are most obviously mimicking. While there’s not a huge amount of bass to speak of, the earbuds, packing aptX and low latency playback, offer good volume levels and a clarity to the audio that’s particularly useful for listening to podcasts and audiobooks. 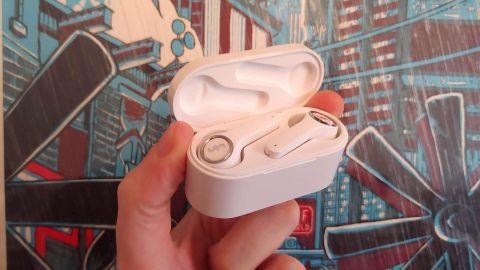 It’s a neutral mix, with little harshness or overly-present low ends to speak of, which is appreciated, but there’s a feeling that, as with the AirPods, there’s a bit of a lack of power and punch to the delivery overall. If there’s one notable failing of the Funcl AI headphones, it’s that they let in a fair amount of ambient noise, even when you nail the seals with perfectly-fitted ear tips. For the most part it’s not too big a deal – sat at home or walking down the street, they’re perfectly loud enough to drown out any exterior sound. However, jump on a flight or on a subway tube, and they have to fight to be heard. Active noise cancellation is still a luxury with true-wireless in ears, so it’s hard to complain too much here, but it’s something we hope to see worked on should a future revised model ever hit stores. We're still pinching ourselves that the Funcl AI true-wireless in-ear earphones can sound as good as they do, and work as well as they do, for the price they sell at. They’re super comfortable to wear, rarely have any connectivity issues and have an excellent battery life, and don’t look too bad in the ear either. They're currently at almost impulse-buy territory, and it’s an impulse you won’t regret if you do. It's a solid outing for Funcl. If Funcl can keep making great value products like this however, they’ll be a brand to watch for the future.